At Twin Peak Dental and Orthodontics Dr. Toth offers custom orthodontic treatments that can lead to straighter teeth, happier smiles, and more confidence. We are proud to offer our Longmont area patients a range of orthodontic services that include Invisalign, traditional braces, and our Healthy Start Program. We also know that getting braces, or any kind of orthodontic appliance, comes with many questions. Below are some of the frequent questions we get about braces. Sticky and chewy foods are the worst offenders for those with braces, with items like gum, caramel, or taffy being big no-nos. These types of food can stick to the brackets and wires of braces and be extremely difficult to get out. Hard foods, like nuts, hard candy, and popcorn, can also damage, or even break, wires and brackets on your braces. 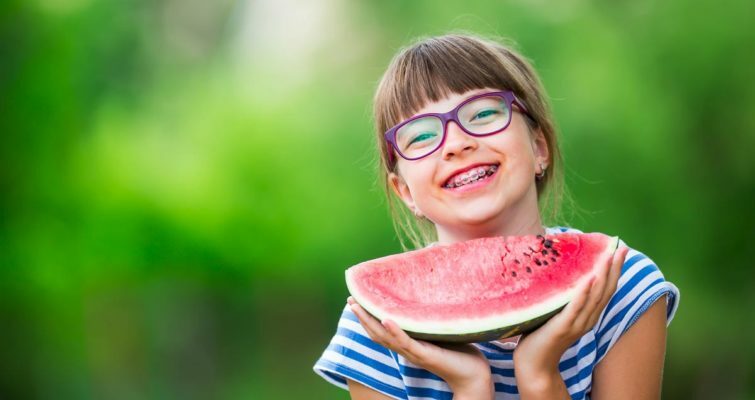 Highly sugared and starchy foods, such as chips, candy bars, or soda are known to cause tooth decay, so should be limited anyways, but especially when wearing braces. You can avoid possible harm to your braces by cutting up other healthy, harder foods like carrots or apples, into manageable smaller pieces before eating them. What oral hygiene routine should I use when wearing braces? Of course, good oral hygiene is always a number one factor in healthy teeth and gums, braces or no braces. When you wear braces, food particles and plaque can be stuck in the tiny space between the brackets and wires. This can result in decay on teeth and can also stain the enamel. Bacteria in your mouth is also known to react to the metal on the braces and the food you eat, and can cause a bleaching effect, which can produce lasting white spots on teeth surfaces. Making sure you brush and floss regularly and use a floss threader are both important keys to avoiding decay, bleaching, or staining of your teeth. How many times a day should I brush when I have braces? We advise patients with braces to brush their teeth after every meal, and use a floss threader once a day to clean in-between the metal brackets and around the wires. You should also remember to inspect your braces in a mirror to make sure there are no signs of stuck food or other issues. If you can’t find time to brush after every meal, then rinsing your mouth completely with water will also help to dislodge particles and keep your mouth cleaner till the next brushing. What is having braces going to feel like? In general, braces correct the teeth’s position by applying pressure that will gradually shift the teeth into a preferred position. To attain this effect, the wires that we use to move the teeth must be tightened on every visit to our office. This tightening can result in pressure on your teeth and minor discomfort. We often advise eating softer foods and taking an over-the-counter pain reliever to help alleviate this. Parts of braces may also rub up against the tissue on the inside of the mouth. If this feeling is too bothersome, then we may give you some wax to put on any wires that may poke out to get rid of the irritation. This answer varies due to the amount of teeth modification that is needed for each patient. For many patients, the time that braces are in place is around 18 to 30 months. Of course, individual times may vary depending on your particular circumstance. Often, once braces are taken off, a retainer may be needed to help preserve the teeth position and help align and set tissue around the newly situated teeth. If you have any other questions about getting braces for yourself or your child, please call and ask our Longmont orthodontic dentist Dr. Brian Toth today!